Goodreads has made many changes since it joined Amazon's evil ebook empire early last year, and late last week they added one which many readers and authors will appreciate. Don’t judge a book by its cover…judge it by what’s inside with our new Preview feature, which launches today! With Preview, you can sample the story before committing to the whole book. Now our U.S. members can get a taste of their next amazing read right on the Goodreads website. The preview feature is based on close integration with the Kindle Store. 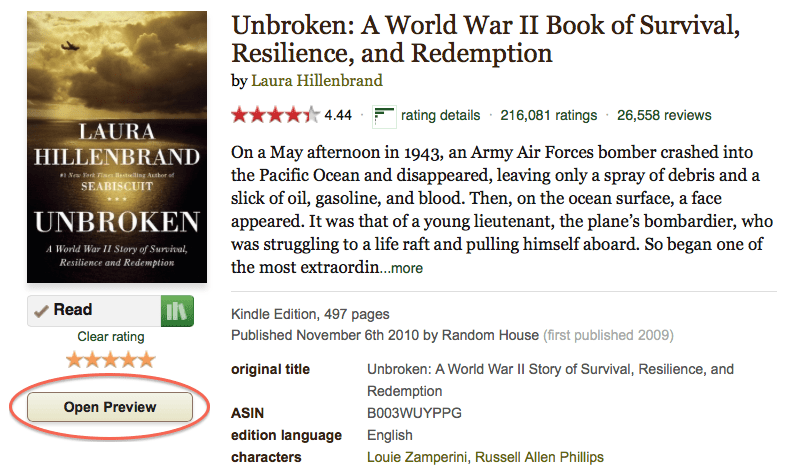 Click the open preview button and the ebook's sample will open in Kindle Cloud Reader. This feature is obviously only available with ebooks which are sold through the Kindle Store, and it's only available to Goodreads members in the US, so it won't do GR's majority non-US membership much good. But I would not be too concerned about the restrictions; Goodreads regularly launches new features as US-only before releasing them internationally. I suspect that limiting access is part of their beta test methodology. This is very neat, will have to check it out. My only gripe, not seeing how it works yet lol! would be if the same preview as on the Kindle store shows up. A lot of my work, the preview barely gets past the front matter. But still a good thing overall, thanks!